I’m not sure that what they’ve done represents the issues well, although I’m only going on the quotes and your presentation here rather than the full paper. For one thing, unless I’m missing something they seem to have made the old mistake of comparing model ensemble means with individual realisations (i.e. observations). When you’re looking at not just regional but also seasonal trends natural variability can have a big influence even on a centennial scale. 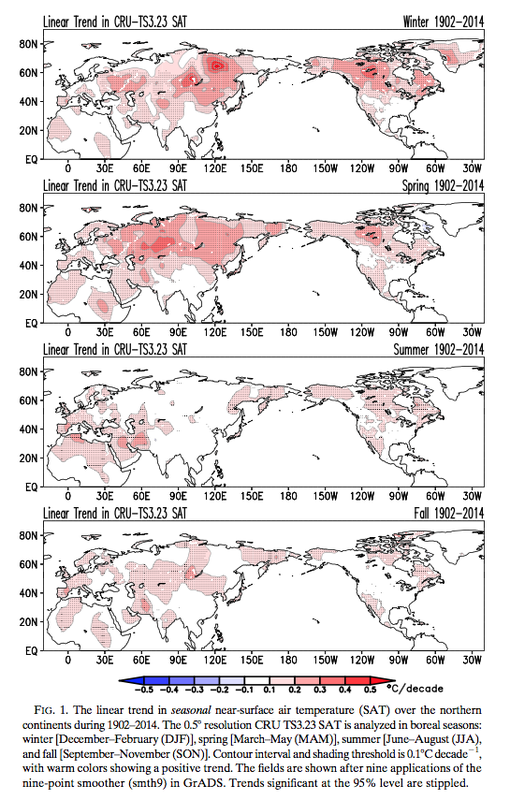 For example, within the highlighted Central Asian area I found 1902-2004 Winter trends across the 5 GFDL-CM3 realisations varying from -0.07K/Decade to +0.16K/Decade. The goal of the overall modelling enterprise (rather than the goal of individual modelling groups) is that the CMIP5/CMIP6/CMIPn ensemble properly represents the range of possible trends. We wouldn’t and shouldn’t expect each model run to precisely reproduce what actually happens/happened, especially at seasonal and regional scales. I think van Oldenborgh et al. 2013 provides a more useful basis for analysing regional simulation within global models, albeit not based on seasonal trend differences. I’ve read van Oldenborgh et al. 2013 before, and now I’ve just reread it. 1. With weather forecasting we have lots of forecast v observations to compare. For example, every week we have a forecast ensemble that might say “10% chance of severe storm in this region”, “40% change of rain” and so on. So we look at how often the various items occurred and compare it with the probabilities the forecast gave. This helps us see if the forecast is skewed – if the “10% events” only occurred 2% of the time then the model is over-estimating these probabilities. 2. We can’t do that with climate forecasts because we are running one long experiment. We have lots of model results (like with weather forecasting) but one observation. So instead we will detrend the global temperature change from the observations and models, break the globe up into a grid so that we have y observations. For each observation we say “where in the spread of model results did it come? around 0 – 5%? between 5-10%? etc. 3. Now we compare – How often did we get the “0-5%”? It should be only 5% of the time. Oh, we got it 15% of the time. How often did we get the observation in the 95-100% of model spread? Oh, we got it 20% of the time. So, conclusion, models don’t do a good job of spatial trends vs observations – they are too close to the average trend, whereas actual observations vary much more. This is how I see the paper. Let me know your thoughts. Yes, that fits my reading. Here’s a few more details from the paper. Four different analyses of the observed near-surface air temperature (SAT) are used to characterize the seasonality of SAT trends. The CRU-TS3.23 monthly analysis from the Climate Research Unit of the University of East Anglia (Harris et al. 2014) is available on a 0.58 continental grid for the January 1901–December 2014 period from http://www. cru.uea.ac.uk/cru/data/hrg/cru_ts_3.23/. 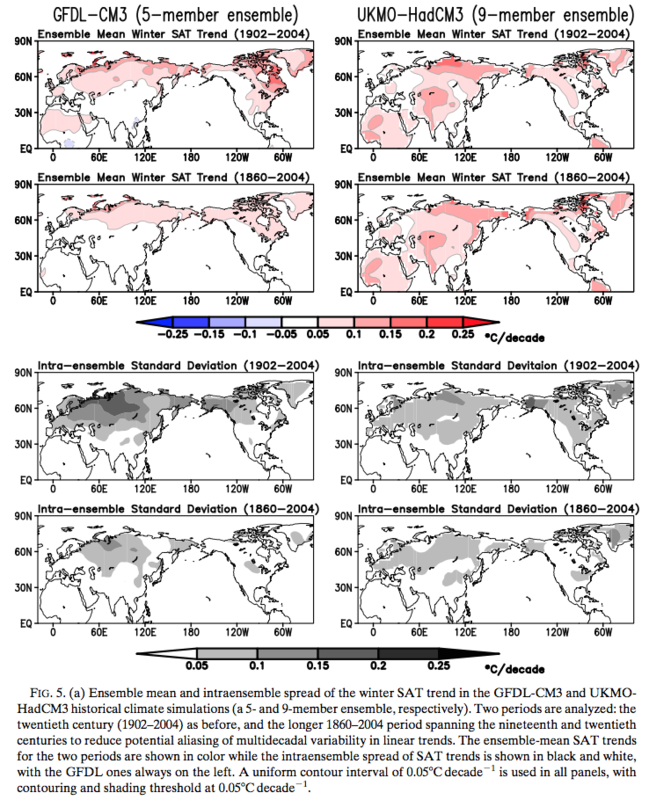 Trends in the near-surface mean temperature (SAT) are analyzed in the present study. The CRUTEM4 analysis from the UK Met Office’s Hadley Centre provides monthly near-surface air tem- perature anomalies relative to the 1961–90 baseline (Jones et al. 2012). It is available on the coarser 5.08 land–ocean grid for the January 1850–September 2015 period from http://www.cru.uea.ac.uk/cru/data/temperature/#datdow, with a fair amount of data missing through the middle part of the twentieth century. Berkeley Earth’s monthly analysis of surface temperature (Rhode et al. 2013) is available on a 1.08 land– ocean grid from 1850–2015 and can be downloaded at http://berkeleyearth.org/data/. Data are provided as anomalies relative to the 1951–80 climatology. Finally, the NASA Goddard Institute for Space Studies (GISS) analysis of near-surface temperature (Hansen et al. 2010) is available on a 2.08 land-ocean grid for the January 1880–September 2015 period from http://www.esrl.noaa. gov/psd/data/gridded/data.gistemp.html. Monthly anomalies relative to the 1951–80 baseline are provided. 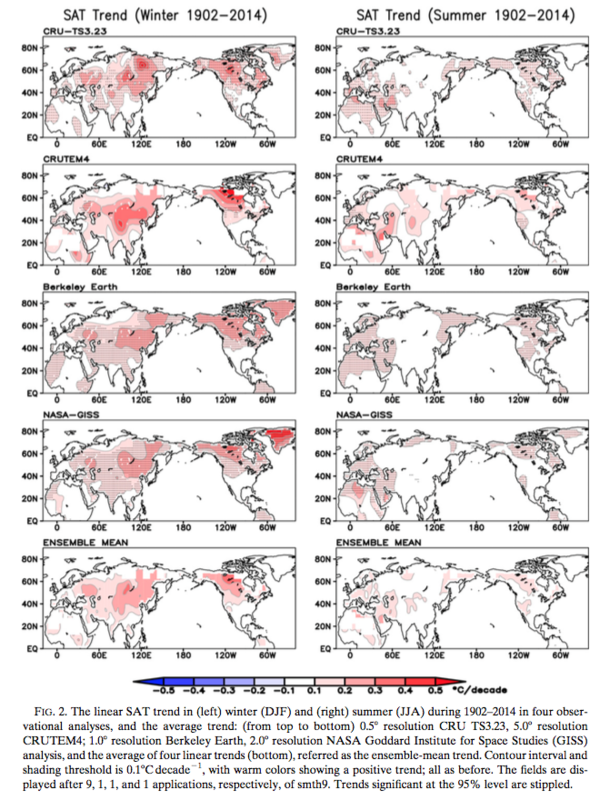 The intraensemble standard deviation (SD) of the century-long linear trend in the GFDL simulations is about twice as large as in HadCM3 simulations, especially over northern Eurasia, but the SD of the century-plus trend is quite comparable (Fig. 5a, lower panels). The impressive decline in the SD of the linear trend with increasing period length in the GFDL case indicates the presence of longer-than-centennial-scale low-frequency variability (or ultra-low-frequency variability) in its historical simulations, with related phase varying across ensemble members. The aliasing of this variability component into the century-long linear trend will depend on its phase in that century, but as all linear trends were computed for the same century (1902–2004), the ultra-low-frequency variability in the GFDL historical simulations is likely to be of ‘‘internal’’ origin (i.e., unforced). The large intraensemble SD of the century-long linear SAT trend in the GFDL simulations, with the SD often larger than the ensemble-averaged trend in the middle- to-high northern latitudes (i.e., the very regions exhibiting the strongest ensemble-averaged trend or potential secular warming) is concerning as the large SD is indicative of significant internal variability in the modeled climate. Is this unforced component of climate variability (‘‘dynamical’’ noise) overwhelming the twentieth-century secular warming signal in the GFDL historical simulations? 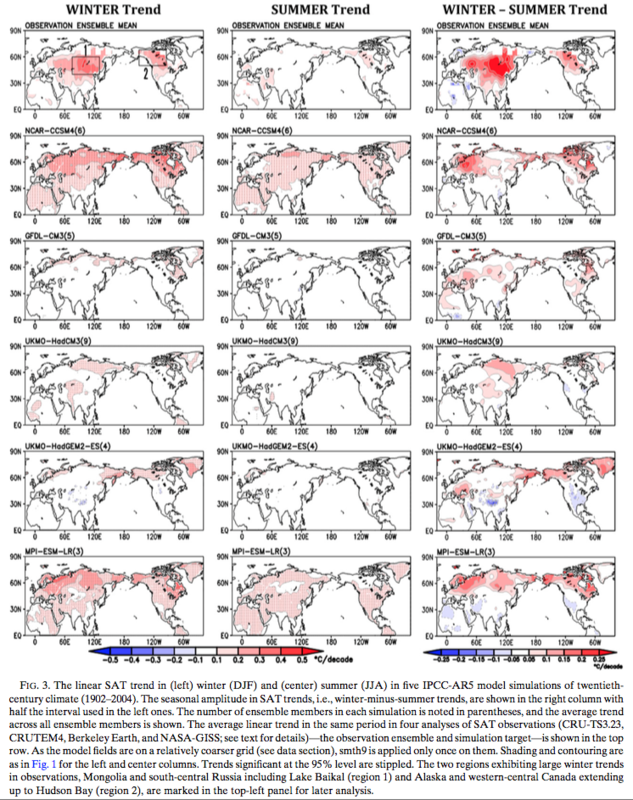 The century-long (i.e., twentieth century) linear winter SAT trends in each ensemble member of the GFDL historical simulations are shown in Fig. 5b along with the ensemble-averaged trend (top panel) for easy reference. Of the five historical simulations, only run 2 yields quasi-realistic winter SAT trends. Interestingly, none of the simulations exhibit the pronounced winter warming trend over western-central Canada seen in observations (Figs. 1 and 2). It would be interesting to examine the amplitude and phase of ultra-low-frequency variability in run 2 (quasi-realistic trends), run 4 (largely devoid of trends), and run 5 (cooling trend over northwestern Eurasia). I posted a bit more from the paper for reference. I think it would be very interesting to see the van Oldenborgh approach used on each season. But I can’t see find a way mentally to come up with the idea that the model is correctly representing the seasonal trends. If we applied this approach and found that the model was not underpredicting variation, or only underpredicting it as much as models currently do for the annual average trends (as in van Oldenborgh) I would be surprised. And how would this happen? I can only picture it happening by some geographically biased dispersion of results. In the meantime I will contact the lead author and ask for his thoughts. My other main comment is that if models cannot reproduce 100 year trends at regional scales then “downscaling” (higher resolution regional modeling based on the output of global GCMs) is probably a fairly useless exercise. I have some thoughts on another article on this subject. Thanks for the extra info. Looks like they did pay attention to individual model realisations and note that some do get close to observations. Sorry, I’m not clear what you’re saying here. Are you talking about whether applying the van Oldenborgh approach to seasonal trends would find the same variability underprediction as for annual? Yes, I suspect that would be the case. On the downscaling, I think that’s partly what motivated van Oldenborgh et al. but it’s not an area I’m familiar with at all so can’t really comment. Except that doesn’t really seem to happen… the crazy-high sensitivity models are not revised to be closer to reality… they remain crazy-high in sensitivity… while the merely high sensitivity models appear static in their projections, even when their many failings are pointed out. A cynic might guess that the motivation is a desire in the climate science community (conscious or not) for the modeled sensitivity to be high to justify draconian public energy policies. Disentangling the convoluted motivations in climate modeling, and indeed, in climate science as a whole, seems to me hardly worth the effort. Better I think to just cut most public funding of models and accept empirical studies as the basis for public policies. Too much politics in science makes for both bad science and bad politics. I’m not clear that they are “crazy-high in sensitivity”, or even what that means as a comparison of values. A cynic might guess that the motivation is a desire in the climate science community (conscious or not) for the modeled sensitivity to be high to justify draconian public energy policies. This blog stays away from imputing motives to people. In contrast, the iris hypothesis predicts a coherent pattern of the climate response to increasing atmospheric greenhouse gas concentrations, which helps to reconcile climate model simulations with observations in a number of respects. Our simulations with a simple parameterization of an effect akin to the iris effect combine realistic month-to-month variability of longwave fluxes out of the tropics, the possibility of sustaining a low-end ECS at the same time as a strong shortwave cloud feedback, and an enhancement of the hydrological sensitivity, while present-day climate remains plausible overall. We suggest that apparent discrepancies between models and observations could be a consequence of the fact that the current climate models systematically miss the effects of convective organization and its dependence on temperature. This paper isn’t some outlier. And why did Nature publish it? Earlier in this thread another commenter highlighted van Oldenborgh et al. 2013 which highlights that models are over-confident via reviewing how often the observations in a grid cell are above the 95% of models spread and below the 5% of model spread (see my comment above). van Oldenborgh is a lead author for chapter 11 of AR5 (working group I). The two papers cited in this article ask difficult questions. If you read press releases in the media and follow certain blogs then you might conclude that all climate scientists are pressing forward into “more alarm”. If you read 100s of climate science papers you will conclude something different. I recommend reading lots of papers to ascertain what climate scientists actually say in climate science papers. To me, “crazy high” sensitivity is anything over 4C per doubling, since that is grossly inconsistent with empirical estimates. Those “crazy high” sensitivity values appear unsupported by anything except a few models and paper based on arm-wave speculation about glacial/interglacial changes in temperature versus changes in global average albedo. An even simpler way to ascertain “crazy high” is to look at the individual model spreads over multiple runs to estimate the likelihood of each model encompassing measured warming over the past 40+ years. When measured reality falls outside the 95% inclusive range for repeated runs of an individual model, then that model is “crazy high” in sensitivity, as many clearly are. I ask always why models which clearly fail the most important test of credibility are neither modified nor discarded. I have never heard a reasoned reply. Of course, when a modeling group submits only a single run to the CMIP archive (as some do), then it is impossible to even judge if the model makes any sense, since you can’t estimate standard deviation from a single run. Those models should simply be discarded as scientifically meaningless. When a model shows a glaring “hot spot” in the tropical troposphere, and none is observed, then that model should be modified or discarded. It doesn’t happen. I have read lots of climate science papers over the past 10+ years, ranging from careful studies by folks like Bjorn Stevens (no coincidence, his PhD adviser was skeptic Richard Lindzen), to wild eyed speculation by folks like Stefan Rahmstorf and his associates about catastrophic sea level increases (eg 1 to 2 meters by 2100). I am underwhelmed by the literature, and political bias seems to me the only reasonable explanation for its poor quality. Real progress in understanding seems to me non-existent in the field: the Charney report in 1979 gave a likely range of sensitivity of 1.5C to 4.5C per doubling of CO2, and AR5 declared the same likely range….. 35 years of international research effort and tens (or hundreds!) of billions of dollars of taxpayer funding, all to conclude what Charney had concluded in 1979 at near-zero taxpayer cost. This is not like any science I am familiar with; it is closer to the aftermath of Roe v Wade in 1973, where people today are no closer to agreement than in 1973. That is the nature of political disagreements, not scientific ones. But if I am wrong about climate science not being ‘normal science’ and you are right (that is, it is a science that is “self correcting” when wrong) surely responsible folks like Bjorn Stevens should step up and offer interviews with MSM outlets to explain that there is considerable uncertainty in the projections of doom by the models. Yes “serious scientists” like Stevens can publish papers which point out flaws in the models, but they dare not take the debate public, or they will suffer the political consequences.. Those serious scientists might also point out in the MSM that projections of catastrophic sea level increases by 2100 are almost certainly and comically wrong. They do not do that, because it would damage their careers, as Roger Pielke Jr, Judith Curry, and others have learned. It is good to read published articles. It is even better to evaluate the field as a whole based on the same criteria other most other science is based on: what scientific progress has been made relative to taxpayer expense? My answer: essentially none that matters. Public de-funding is the most reasonable political response to what seem to me fundamentally a political disagreement. I rescued Steve’s Nov 21 comment from the filter, so people won’t have seen it until now (Nov 24). As explained in Comments & Moderation let me know if comments don’t make it through, WordPress has its own ideas. The paper in Climate Sensitivity – Stevens et al 2016 also seems to think that 4.5K is very high. I wanted to get the value you believed was crazy high. Real progress in understanding seems to me non-existent in the field: the Charney report in 1979 gave a likely range of sensitivity of 1.5C to 4.5C per doubling of CO2, and AR5 declared the same likely range….. 35 years of international research effort and tens (or hundreds!) of billions of dollars of taxpayer funding, all to conclude what Charney had concluded in 1979 at near-zero taxpayer cost. Papers I read acknowledge this problem and how serious it is. You think science shouldn’t try? Climate is a hard problem. This is where I believe my article The Debate is Over – 99% of Scientists believe Gravity and the Heliocentric Solar System so therefore.. has relevance. The questions about how sensitive climate is, how reliable models are and so on are essentially value judgements unrelated to the core questions of atmospheric physics. But if I am wrong about climate science not being ‘normal science’ and you are right (that is, it is a science that is “self correcting” when wrong) surely responsible folks like Bjorn Stevens should step up and offer interviews with MSM outlets to explain that there is considerable uncertainty in the projections of doom by the models. There’s science and there’s politics and the media. What people publish tell you something about their science work – and that tells me the hard questions get asked. What gets reported in the media is just some strange world unrelated to reality. Plus, you might have a family to feed and trying to “straighten out” media bias in any field, even a simple one, is a task for a special kind of person who has some (mistaken) idea the media gives a hoot about “reality”. Let me offer a concrete example: my company makes laboratory instruments which measure the size distribution in fine particulate materials, down to single nanometer size in many cases. So the instruments are often used by people working in ‘nanotechnology’ applications. There is already a significant political push by (no surprise) greens in Europe to institute regulations restricting the development and use of ‘nanomaterials’, demanding ‘zero risk’ for humans and the environment. It is all scientifically laughable (nanomaterials are everywhere in nature! ), but the potential costs for those regulations is large and pointless. If this madness metasticizes beyond Europe, I will do everything I can to ‘set the record straight’. Whether it is climate change, GM plant/animals, nuclear power, nanomaterials, or other subjects, greens politics is costly and damaging… and it seems to me pervasive in climate science. Thanks for liberating my comment. I had an error in that comment: Bjorn Stevens studied under William Cotton at Colorado, not Lindzen at MIT. WRT misrepresentations in the MSM, I think responsible people working in any field, and especially one that is publicly funded, have an obligation to set the record straight when there are gross misrepresentations of factual reality…. like the endless Photoshop images of New York City under 30 meters of water, with a caption like “After Antarctica melts”….. being used to advance green political goals. SOD and Steve, I think the issue here is that there are always choices to be made in terms of data selection and parameter selection. It seems to me that there is generally a tendency in climate science to select data and tune parameters to make things seem more serious. Just look at Steve McIntyre’s recent post on models vs. temperature data to see what I mean. He illustrates how the choice made can lower the GCM rate of temperature change by a large amount and bringing it down to where the data is. And then he shows how another data selection gives a hugely lower data rate of change. This problem is seen most clearly in Mann’s original work where it almost seemed as if a non-standard statistical method was developed specifically to generate the desired result. The whole field of paleo-climatology is an example of how very uncertain data can be “processed” to agree with pre-conceived notions about CO2 as THE control know. It seems to me that we are still a ways from understanding the ice age cycle changes and their causes. Those were huge changes. This issue infests a lot of science. It is very common in CFD where data is “selected” to make the authors and their methods/codes look good. This is classical selection bias. I forgot to mention “consensus enforcement” which is a powerful mechanism to intimidate people and scientists who might have doubts. The problem here is more the non-scientists like Joe Romm who are basically political operatives of the same ilk as Fusion GPS, who become experts at intimidation. But there are some scientists who do this too. Mann is pretty abusive in his pronouncements about fellow scientists who he disagrees with. This graph shows the global average near-surface temperature from the model with the highest diagnosed ECS in CMIP5 against observations. What basis is there for certainty that the model sensitivity needs to be revised? (Note there is a ~0.1K/Century positive trend in the model control run so the end of the series shown is about 0.15K warmer than a more proper comparison). What I suspect you mean by ’empirical’ here is specifically studies using simple energy balance models of climate. There are other forms of empirical study which point to the high end of the model range. The big question (though there are others) for simple energy balance studies is why we should trust a one line equation to provide a completely accurate model of global average climate? Absolute trust in such accuracy is a fundamental untested assumption in all those studies. Our only means to test that assumption is through climate models, and several studies have found important non-linearities which suggest energy balance results don’t take into account highly important structural uncertainties. Which demonstrates the value of climate modelling working in conjunction with simplistic empirical approaches. It seems to me that the willingness to unquestioningly accept and promote certain empirical (e.g. energy balance) results above all others has been dependent on the magnitude of the result, which suggests that the idea empirical = apolitical is not correct. on November 22, 2017 at 3:29 pm | Reply Mike M.
From what I can find in AR5, MIROC uses very large negative direct and indirect aerosol forcing to largely cancel out the greenhouse gas forcing to date. That allows them to get good agreement with the historical record in spite of a high sensitivity. But satellite data now constrain the aerosol forcing to much smaller values than used in MIROC. So the good agreement of MIROC with observational temperature seems to be all tuning without predictive value. The early empirical studies were simple energy balance models, but much more sophisticated ones have since been done, with the same result. A simple model, if based on fundamentals, can often give a more trustworthy result than a more complex model that depends on a lot of tunable parameters. The complex models seem to confirm the basic validity of the simple energy balance approach. But satellite data now constrain the aerosol forcing to much smaller values than used in MIROC. Can’t see where you’re getting that from. According to the MIROC-ESM write-up aerosol forcing in the model is -1.1W/m2 relative to 1850. It will probably be a bit more negative relative to 1750 but still close to the IPCC central estimate and well within uncertainty ranges of studies using satellite data. Whether or not it’s tuned is kind of irrelevant for this question when all the “choices” are plausible. The complex models seem to confirm the basic validity of the simple energy balance approach. But that’s essentially the rub of it though. The simple models gain their validity through approximately emulating complex models, and the fact that responses in complex models tend to be roughly linear. So it doesn’t make any sense to then completely ignore the complex models when it turns out ‘approximately’ and ‘roughly’ aren’t good enough if you want to accurately constrain climate sensitivity. Well, the actual AR5 best estimate for net aerosol offsets (primary and secondary) was 0.82 watt/M^2. The majority of that (0.55 watt/M^2) is described by AR5 as a “low certainty” secondary cloud effect, and indeed, the uncertainty range for that secondary effect covers from 1.33 o 0.06 watt/M^2. In fact, this presummed secondary effect is the ONLY major forcing which is described by AR5 as having “low confidence” (see figure SPM5). Any meaningful constraint on climate sensitivity will not come from climate models (any more than understanding the universe will come from gazing at your own navel), it will come from eliminating most of the uncertainty in secondary aerosol offsets. BTW, simple models gain their validity not by emulating complex models, but rather by being congruent with reality… as all valid models must be. global warming means reduced temperature extremes. Though the spatial distribution differs, this is true of the seasonal variation ( increased winter temperatures and comparatively little change in summer temperatures ). This has long been modeled. Arctic sea ice acts out of phase with seasonal variation: melting takes up heat in summer, and increased freezing releases latent heat in winter. In general, yes I think, though there are some notable exceptions like Western Europe, where Winter temperatures are expected to warm slower than Summer, generally attributed to AMOC slowdown. Interestingly the opposite effect is visible in Extratropical NH SSTs – a very clear seasonal cycle has appeared in anomalies, with Summer warming faster than Winter. Presumably related to the strong Winter warming on land, through some sort of land-sea flux? Don’t confuse the overturning circulation with the oceanic gyre. The Gulf Stream, part of the North Atlantic Gyre, is driven by winds, specifically the northern hemisphere trade winds, not the overturning circulation. If the overturning circulation stopped, the Gulf Stream would still flow.